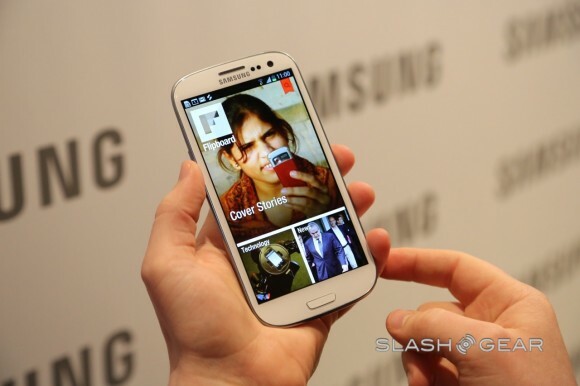 After months of speculation, Samsung finally revealed to the Samsung Galaxy S III during an event in London! New features, a good handful of new technology and many interesting ideas, the Samsung Galaxy S III is a good setup and a terminal that has many ballots to become the new king of the Androids. On the media has an 8 megapixel camera with features to make better pictures and remove noise from photos or doing a series of photos and select the best of them. Its main feature is a 4.8-inch, HD Super AMOLED display and even greater than that of its predecessor and iPhone 4S. Representing 22% more screen but has greatly reduced the margin of the edges so that the phone does not increase in size disproportionately. The resolution is 1280×720 pixels. Bluetooth 4.0, GPS and Glonass, apart from support for LTE and other basic and standard features on a smartphone at this point. 8 megapixel shot blast and very advanced sharing options that are developed below. Implements a technology that is completely annulled the delay between the moment we press the shutter and the time is triggered. It sees your best side: automatically takes a burst of 8 to make a continuous scene and chooses the best. With the front camera, can record video in HD and as seen in other phones like the HTC can take pictures while recording video. Stay Smart, for example, uses the front camera to monitor our eyes and maintain a certain level of brightness. To be monitoring our eyes, you can keep the screen on when it detects that we are seeing, and decrease the brightness (or off) when not. The lines of the new Galaxy S III are much softer than its predecessor, which were more square and rectangular. The back is slightly curved and somewhat resembles the Samsung Galaxy Nexus. At the bottom we find the start button with the classic Samsung look, the menu button and return. As we have two available colors: Black and white ivory. The finish, though, is still that cheap-looking plastic to the company we have come a shame after all those rumors that pointed to improvements in this regard. All your sinks appearance, customization, sounds, ringtones are inspired by nature. From the lock screen to curved lines, the Galaxy S III is a phone that denotes the company’s effort to give it a more human and natural. Samsung technology to do two things at once. For example, watching a movie and want to find something on the internet. We’ll just have to play a dedicated button and jump a thumbnail of the video, you can move around the screen and what happens to one side leaving the rest for us to perform secondary actions. 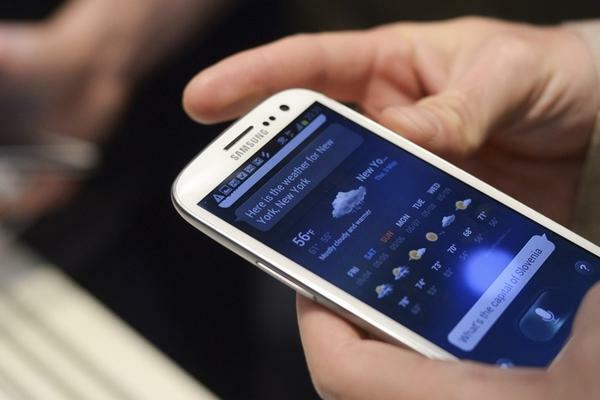 The new Samsung Galaxy S III has advanced voice recognition, including to unlock it, missed calls, ask for time or dictate messages. 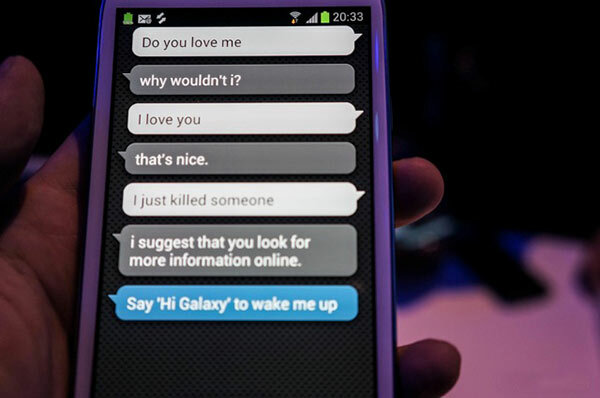 It is the clear answer by Samsung to Apple Siri. The technology is called Voice S and allows natural language recognition. The big advantage is not dependent on a button but simply uttering a series of voice commands to wake him as “Hello Galaxy” and then ask for time to shoot a photo or all the actions you want. Recognizes 8 languages. It is a face recognition tool with a social focus, ie the photos we take of our family, for example, recognizes faces and opens dialog boxes on it to call it directly, for example, send a message , a personalized email or other actions. Sharing is one of the essential pillars of the new Samsung Galaxy S III, characterized by the inclusion of new features to facilitate action to share any content that we have on the phone. S Beam combining NFC with WiFi Direct, simply to bring two phones one of which is playing the video or displaying the image, touch the screen and automatically show us an option to pass it to another device. It also presents a set device for television called AllShare Cast Dongle allows us to use this technology on a TV. Again emphasizing the ease of sharing, when we take a picture, the phone recognizes who is in the photo and your contact information so we can use email or instant messaging to communicate with it. These sharing features are not limited to the native interface they will open a series of APIs for developers to implement them in your applications and make use of them. Unlock screen : A new unlock screen that simulates a zen pond, we just need to “stir” the water’s surface with your finger to unlock it. Direct Call : Use the proximity sensor and the motion to call directly if you want. Smart Alert : A new system that informs us of all calls, missed messages and notifications. 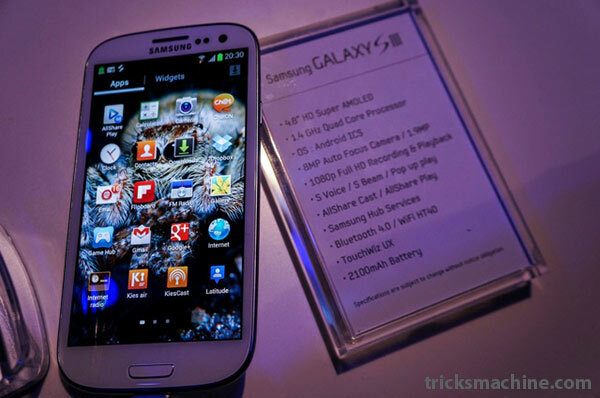 Remote access : The new Samsung Galaxy S III incorporates remote access options for up to 4 devices. NFC : Besides sharing has also been emphasized during the presentation on the use of this technology for mobile payments. It will be released in late May in Europe and the rest of the world arrive in the coming months, in 145 countries. Is a Native App Always the Justified Solution?